Commemorating the life, love and legacy of Aggie Weston — Aggie Weston's – Helping serving sailors, marines and their families. 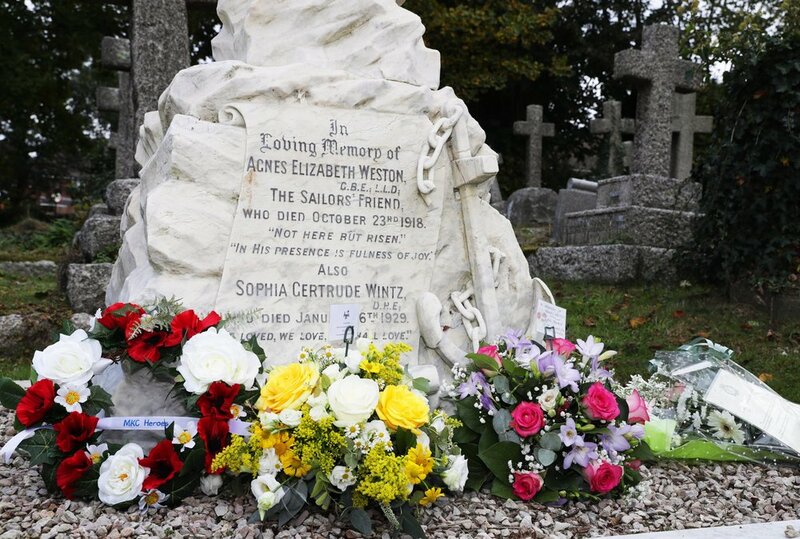 On Monday 15th October, Trustees, Staff and guests of the charity gathered at Weston Mill Cemetery to commemorate the life, love and legacy of Dame Agnes Weston. The service was conducted by Reverend Bill Gates with speeches made by RN Chaplain Reverend Janice Honey-Morgan, Aggies Pastoral Worker Mr Simon Thomas and Reverend Dr Scott Shackleton Deputy Chaplain of the Fleet. Afterwards, invited guests enjoyed a reception at Plymouth Guildhall where they heard first hand accounts of the legacy of Aggie Weston’s, had the opportunity catch up with old friends and discover the work of Today’s Aggies. Agnes Weston lived a remarkable life, sacrificing the comfort of a middle class professional home in Bath in order to work with lowly sailors, or “Bluejackets.” She had worked in support of Army personnel in Bath and wrote supportive letters to many of these when they were posted abroad. Her initial connection with the Royal Navy began in 1868 when a sailor on a troopship (HMS CROCODILE) heard of her letter writing and asked to be included. From that point she began to devote her life to her mission of working with the sailors of Queen Victoria’s Royal Navy. In 1876, at the request of a group of sailors from HMS DRYAD, and with the assistance of her life-long friend Sophia Wintz, “Aggie” opened the first Sailor’s Rest on Fore Street in Devonport. Two years later in 1878 the second Sailor’s Rest was opened on Commercial Road in Portsmouth. The title of ‘Royal’ was bestowed on the Rests in 1892 when Queen Victoria issued her Royal Warrant. In her autobiography Dame Agnes noted that the Royal Sailor’s Rest in Devonport and Portsmouth had over 1400 beds between them, and the total of men sleeping in them was over 350,000 per year, with many more using the Rests without sleeping in them. Aggie’s desire was always to stay “in the harness” until the very end and she managed to do exactly that. After completing “another day’s work” she retired to her bed at the Royal Sailor’s Rest in Devonport and died in the early hours of the morning on 23 October 1918. Patron. Today ‘Aggies’ supports serving sailors, marines and their families through the provision of Pastoral Workers who are there to listen, encourage, comfort and support their beneficiaries. The charity also provides support to families through practical projects such as Storybook Waves, The Ark community project in Plymouth and Aggies at Rowner.